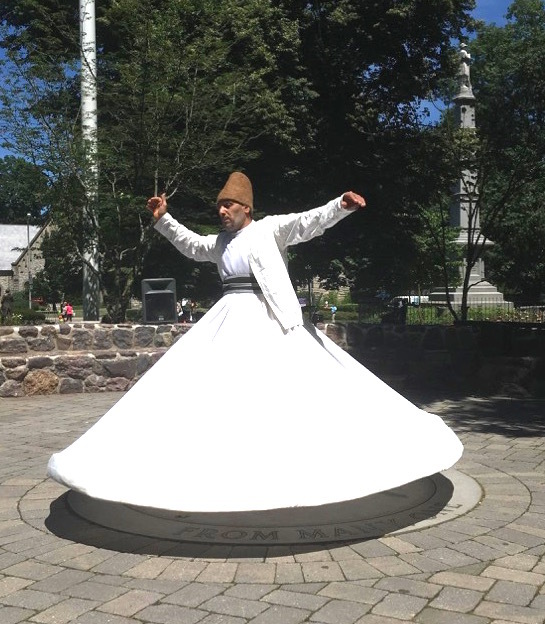 Adnan Tarakji, a Syrian immigrant, performing the Mevlevi (Whirling Dervish) Dance at Diversity Day 2018 in Morristown. Photo by Carly Cannavina. 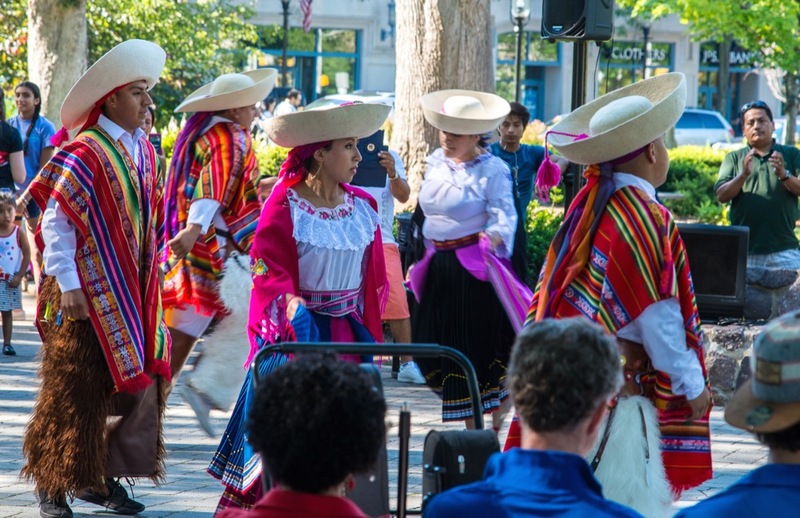 The historic Morristown Green was a swirling kaleidoscope of cultures on Sunday, featuring everything from traditional worship services to a Whirling Dervish Dance. Unity and tolerance were celebrated at the town’s first Diversity Day— an interfaith, multicultural experience designed to introduce citizens to their unique neighbors. The idea originated with Beverly Tignor, a chair of the church’s Elders board. She and her team brought together 17 organizations, which set up booths around the Green and engaged, after a morning interfaith service, in an afternoon of dialogue about the identities they represented. At the center of the town square, meanwhile, performers danced, sang, and played instruments traditional to their own cultures. Why does Diversity Day matter? “Because most people here have never been to a mosque,” responded Mohammad Ali Chaudry, president of the Islamic Society of Basking Ridge, who led afternoon prayers on the Green. In today’s tense political climate, he said, first-hand interactions with people of different cultures can develop empathy and counteract fear-mongering. Nearby, Jenna and Adam, children manning the Islamic Society’s table, eagerly explained to strangers the five pillars of Islam— faith, prayer, charity, fasting, and pilgrimage. She explained to passersby that the word Romani is meant to replace the more problematic term, “Gypsy,” in describing the ethnic group that originated in India thousands of years ago and has since migrated throughout Europe and Asia. Near the fountain, the Morris County branch of the NAACP distributed resources for young people that included a civil rights-themed coloring book. The branch’s program director, the Rev. Forrest M. Pritchett, reminded those who asked that the civil rights movement did not begin with Dr. Martin Luther King Jr., nor did it not end with him. Black America’s quest for equality continues, he said. Across the street from the Green, in front of the Presbyterian Church, booths gave out free food samples. Performers included Adnan Tarakji, a Syrian immigrant who did the Whirling Dervish Dance. He spun rhythmically while a musical track called God’s name over and over in Turkish. This dance traditionally allows Islamic people to lose themselves and find God, according to Chaudry. The Lintet jazz trio opened with what trumpet player Peter Lin described as a “relevant tune,” Now Is The Time, by Charlie Parker. Others on the docket included Albanian and Ecuadorian dance groups, the Neighborhood House Children’s Chorus, the Morristown Jewish Center Chorus, and the Morristown Uke Jam. His mom, lifelong town resident Donna Bryce, said she was glad they explored the activities on the Green. “I love that people of different races, religions and cultures can learn about each other, rather than shunning each other. “It’s good for young people to see this. We all have our issues and differences. But inside we are all the same,” said Bryce, who sees a diverse range of people at her job, in the emergency department of Morristown Medical Center. “It’s really a feel-good day, a wonderful community-builder,” said Randolph resident Debbie Goldstein, who came with her husband Doug and sons Russell, 9, and Jonah, 6. “It’s so useful, and so needed. It shows we all have differences, but we all have so much in common. It’s only positive. Everyone will leave here feeling good,” Goldstein said. Jack Scharf, a preacher at the Morristown United Methodist Church, was optimistic that Diversity Day will become its own tradition. Was a very nice event. I dislike how politics gets hold of so many issues . Too many take up sides , attack and stop listening and nothing gets done. Hatred takes over. Sad. Time to respect each other . I know of no typical Democrat, who favors crime, abuse or the mistreatment of others by anyone. Perhaps it’s the Republicans, who need to take another look and consider the acts their fellow Republican candidates are condoning here in New Jersey and nationwide by following the lead of their president. This was a beautiful event. Inspiring to see so many different faith traditions worshiping together in the morning, followed by celebrations of various cultural traditions. The Latino Pentecostal, Pakistani-American Muslim, Conservative Jewish Cantor, and Presbyterian Pastor all delivered memorable words about how we are stronger together. A great celebration of true American values – liberty, freedom, respect, tolerance. I’m all for diversity anything, but when it’s done in opposition of a administration, it erases all good that it could’ve done for this community. same people out protesting against anything a republican does. Diversity is a code word for the left and little to do with cultural diversity. I have lived over seas a number of time….and love foreign cultures. But Democrats want NO BORDER control…which is a Separate Issue….but they try to bludgeon the GOP by combining the issues! What a great day and a great tribute to a special community. It’s why my colleagues and I at the Center for Diversity and Equality in Education have been engaged in a multi-year project on the Morris school district, which will culminate this year with a book to be published by Teachers College Press at Columbia University celebrating the district’s distinctive diversity.